There’s nothing like chocolate cake. I have been craving something sweet for months but been attempting to eat a bit healthier so haven’t been making as many sweet treats as I used to. I figured I could try my hand at healthying-up an old favorite — delicate and rich chocolate bundt cake. I’m not really sure what the whole point of baking the cake in the bundt cake pan is, I just know it makes it easy to slice and eat without a plate, which is sometimes essential as a mom that might have to steal a sweet snack on the fly. 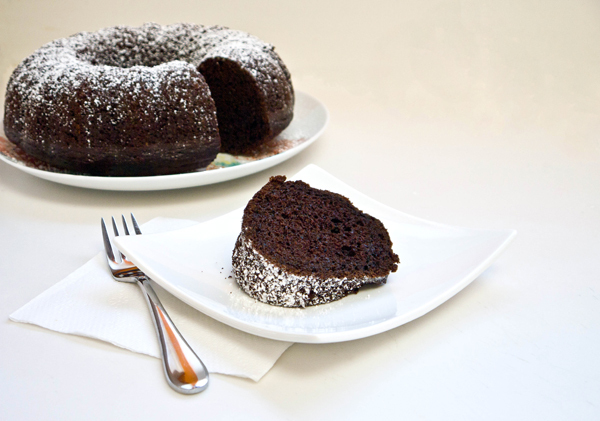 This recipe uses half the sugar and flour than other chocolate bundt cake recipes call for and has a few secret ingredients that make it super moist. All I know is I baked the lovely cake on Sunday, and even though there is still a good chunk of it left, my husband is still raving about how good it is, my daughter begs for a slice all hours of the day, and a skinny sliver takes care of my chocolate cravings. Preheat the oven to 350F and prep your bundt pan by giving it a rub down with vegetable oil and then a dusting of flour. Now add the cocoa, sugar, honey, salt, vanilla, yogurt, and oil in a medium mixing bowl and give a stir until the cocoa is incorporated. Now you can toss in the eggs and banana and use a hand mixer to really create a smooth batter. You don’t really taste the banana or yogurt, but they help make the cake seriously moist. Slowly add the flour, baking soda and powder, and give another quick blend with the hand mixer. Pour into the prepared bundt pan and pop in the hot oven for 50 to 60-minutes. You want the center to just be set, which makes the cake seriously moist. Let the cake rest for 20-minutes and then flip onto a plate. Dust with powdered sugar, drizzle with honey, drench with chocolate syrup, or just eat plain with a scoop of vanilla ice cream.